Game shops are definitely a dream place for who cannot live without game and Shopify Gameworld is the perfect theme for the stores. It has such a stunning graphics and visual effect that any gamer will be impressed. CSS3/HTML5 show special display effects and slideshow is more than that, it is an effective promotional tool for you. Color combination of this template emphasizes something really strong and bold as in an action game. Texture and colors are all skillful designed to set off the store’s spirit and games’ soul. Maximizing space for the website buy sorting all product by product widget and it is also being shown in carousel effects. It allows customers to watch massive different products but the layout is kept in neat and clean structure. Blog integration, extra footer or social network brings you and your client closer connection. 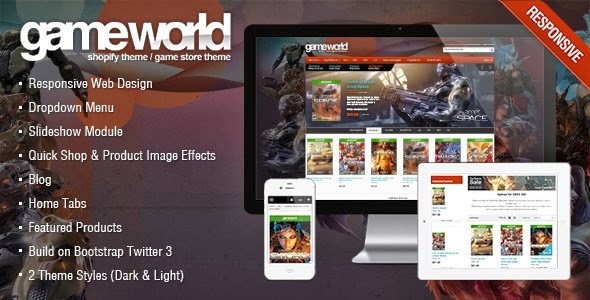 Item Reviewed: Game Store Shopify Theme - GameWorld 9 out of 10 based on 10 ratings. 9 user reviews.